This week on Awesomecast 162, our two man crew is John Chichilla (@chilla) and Mike Sorg (@sorgatron) talking tech. Chichilla thinks Double Robotics might be good technology for kids in school. Check out why. How long is the battery life for Double Robotics? How does it charge? Sorg looks for the answers! What are some ideas for using Double Robotics? Chichilla and Sorg discuss. Sorg broke his phone. This leads into an honorable mention for awesome thing of the week, it is AppleCare + . Hear why he likes it! The cast further discusses phone insurance packages. ChichillaÃ¢? ?s awesome thing of the week is Cheapcast,; if you have some old hardware, you can still do some awesome things with it! The cast talks some Quip and Mixbit. If you have IOS, check them out! Is IOS the way to start a new program/app? Kindle Fire, is it worth owning if you do not like books? XE8 app for GoogleGlass was just released. What our the changes? Making notes and setting reminders on devices is discussed. Chichilla bought a Samsung Smart PC. Check out his opinion on his new toy. You can now make apps on GoogleGlass using SimpleWing. Chichilla talks about a Widget app that lets you create and sell an app you make! A new Google Map EasterEgg has a Doctor Who theme to it. Check it out. The cast talks about the wonderment Google creates to promote its products. 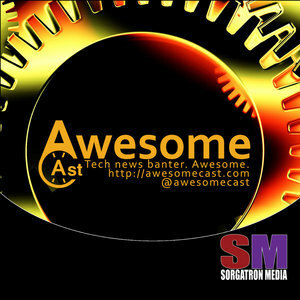 If you have something awesome to share, e-mail us at contact@awesomecast.com. Also, make sure to check us out live at 7 PM on live.sorgatronmedia.com and follow us on Twitter @awesomecast ! And check out the links we used and didnÃ¢? ?t use in the show notes!